ESO Supernova Exhibition — What is the structure of the Milky Way? What is the structure of the Milky Way? The disc of our Milky Way galaxy is embedded in an extended halo that contains globular clusters, remnants of satellite galaxies, and dark matter. 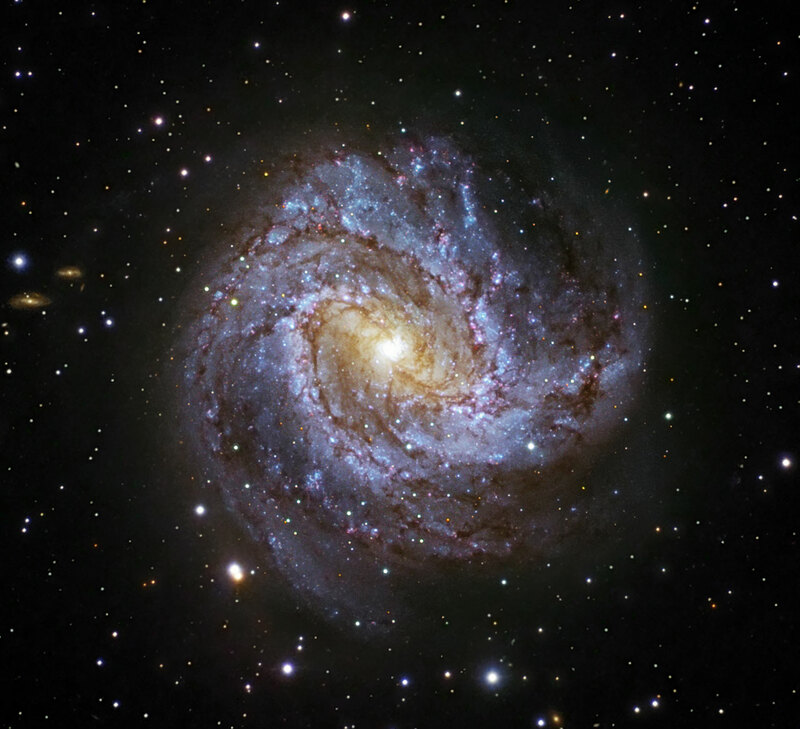 Little sister: Although it’s much smaller, the Southern Pinwheel galaxy (Messier 83) looks very much like our own Milky Way, with an elongated central bulge and bright spiral arms. 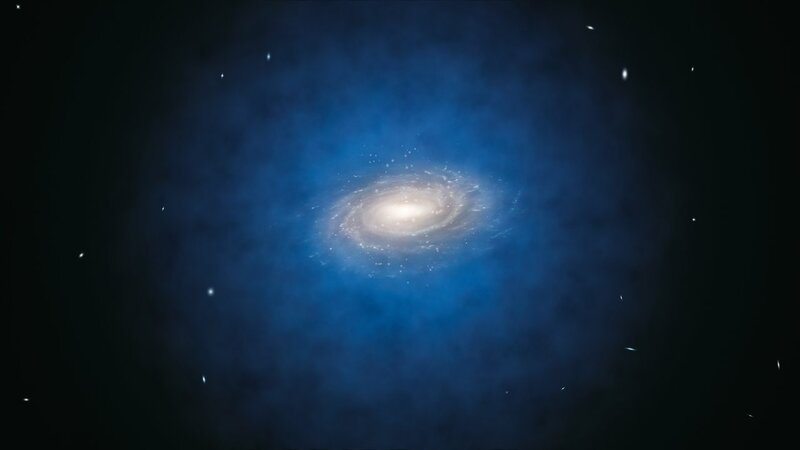 Mysterious matter: If the mysterious dark matter in the Universe were to emit blue light, this is what the halo of our Milky Way galaxy would look like (artist’s impression). Mapping the 3D-structure of the Milky Way is difficult as we cannot see it from the outside. Still, over the past decades, astronomers have revealed the main components of the Milky Way. There are the stellar disc, majestic spiral arms and a central bulge. Then there is an extended halo with globular clusters and the remains of dwarf satellite galaxies. The halo’s gravitational effect on the motions of stars indicates that it must also contain huge amounts of dark matter, estimated to be at least 10 times the mass of the stars in the Milky Way. In the galactic halo astronomers have discovered the remnants of disrupted dwarf galaxies. Their material is added to the pool of matter in the Milky Way. In fact, without a dark matter halo, thin galactic discs would not be stable. The central bulge also harbours a supermassive black hole at its core. Purple lagoon: Glowing hydrogen gas in the Lagoon Nebula – a star-forming region in one of the Milky Way’s spiral arms – is colour-coded purple in this infrared image. Could you draw a map of your home town if you were not allowed to leave your house? That's how difficult it has been for astronomers to find out what our Milky Way looks like.